Pierrot is a stock character of pantomime and commedia dell’arte, a semi-improvised form of Italian masked theater that had a huge impact on the arts of Europe. It’s one of the oldest forms of clowning. And by clowning, I don’t mean the sort of half-decent party clown, I mean the highly difficult art form that often requires actors to wear masks, do acrobatics and be funny- all the same time. Respect clowns. It’s a darn hard art form. Pierrot developed in the late seventeenth-century, making him a younger stock character than most of the other stock male characters in commedia dell’arte. Interestingly, Pierrot has evolved over the years. He started out as a naive buffoon, pining after the beautiful Columbina, but inevitably losing out to Harlequin (another stock character) and never learning his lesson. Over time though, the sort of innocence of Pierott became seen as a sympathetic character. Interestingly, Pierrot is also heavily featured in artwork. Often see as representing the innocence of the artist in the cruel unforgiving world. It also helps, not doubt, that his traditional outfit is so distinct- white face, white smock, loose white pants. I love how the costumes of commedia dell’arte stock characters are so distinct. You know immediately who is who which was, one should note, kind of the point. One of these day’s I’ll do Harlequin or Columbina, but I haven’t gotten around to that yet. Obviously, today’s Pierott inspired outfit is based on Pierott’s traditional outfit of white smock, loose white pants, fluffy buttons, hat and ruff around his neck. I modified it, obviously, but that’s the basic theme. Sometime around the 1920s, Pierott’s costume added black to the white. You don’t see it much before that. There’s also some gender-bending in that era where you see very feminine Pierott images appearing. So, my lady costume for Pierott isn’t totally out of the realm of possibility. Around the Internet: Wikipedia’s long article on Pierott. Quick Overview of commedia dell’arte, & TV Tropes nice overview of Stock Characters in commedia dell’arte. A few of my favorite Pierott’s in art include- Schwarzer Pierrot from 1908 by Fritz Erler, Pierrot & Arlecine (Harlequinn) from 1914 by Russian artist Alexandre Jacovleff, and Self-portrait as Piero from 1911 by Zinaida Serebriakova. If you’re interested in checking out a few more of the clown. I actually have a strange affection in my heart for masked theater. If you can actually find some that is well done, it’s a really fascinating art form. I digress. My Friday Patreon outfit is also theater inspired, but in a more circus sense. Join us on Patreon if you’d like to check it out. Support through Patreon is what keeps PTP around. Do you like clowns? Do they freak you out? (No shame if they do.) I personally am cool with clowns (and have known a few), but I admit that the sterotypical clown outfits do nothing for me. I would probably draw nothing but fantasy dresses for quite some time and never get bored, because there’s so much history to fashion to dip into a try. People have been wearing clothing for pretty much, well, ever. So, it’s a huge deep pool of neat stuff to pull ideas from. Today’s paper doll gown is very much a renaissance inspired gown, though it’s not historically accurate in anyway. By the way, the dress is really close to Italian renaissance styles which the high waist and the split sleeves that show off the shift underneath. Specific Source Images: I didn’t really look at anything while I was drawing it (the perk of spending so much of my free time collecting clothing images), but if you’re interested in similar styles here’s a few options: This gown, this gown and this gown. Around the Internet:Actual Renaissance Dresses from Italy look different than this one. Here’s a few: this one , these ones or this one. I love drawing super detailed pattern motifs, like the one above, until I am coloring them. While I am coloring them a little piece of me cries and cries and wonders what I did it. Such a pain to color! Despite that, I chose to color this twice. No really! There’s a second blue version over on my Patreon page that anyone can see and download. Meanwhile, I’d love to hear which version you like better. This teal version or this blue version? Archives Collection: All the Valentine’s Day Paper Dolls Thus Far! I know, I know it’a not Friday. I’m mixing things up this week. The thing is that if say a parent wanted to print out a Valentine’s Day Printable for their kid, it would be much easier to do that today rather than wait until Thursday. So, while there will be a Valentine’s paper doll on Thursday, I thought should do my weekly archives post today in case one of these other Valentine’s Day paper dolls might be something you might want to use. I will also add, I felt a little weird putting this together, because it will be out of date the moment I get up this years paper doll, but that happens. Valentine’s Day is one of my two favorite holidays to draw paper dolls for. The other is Halloween, of course. Do you have a favorite holiday to create for? Let me know in a comment. I occasionally feel odd posting things that are as old as this. I drew flora back in 2011 towards the end of my first master’s program. She was inspired by the fashion dolls of the early 19th century. I had a lot of fun drawing her and drawing all her dresses. Who knew it was so much fun to draw regency coloring pages? Seriously. Some of these dresses I did a good job citing, but others not so much. I’ve become much better at that now. Still, I think there’s a nice range of designs from early fashion to later styles. I really loved drawing for Flora and the exercise did give me a much better knowledge of clothing of the early part of the 19th century. I wasn’t as good at noticing trends in historical dress as I am now. I’ve learned a lot. She would be such a fun project to cut and color for a child learning about the era. I really fell in love with history through clothing, so I often think of children like me (when I was one) when I design my historical paper dolls. I want to open up the complexities of social history and present it in a way that seems approachable. So, I hope these regency coloring pages might do that. I hope everyone has enjoyed regency fashion week as much as I have. If you’re a patron, there’s a morning dress which I think is super fun (and covered in ruffles). Okay, so I know I’m not supposed to have favorites, but I do. And this Walking Dress was one of my two favorite dresses I drew for Monday’s Regency paper doll. My other favorite is a morning dress that is going up for my Patrons on Patreon on Friday. Today’s walking dress was a form of half-dress, for those keeping track, which means we’re really only missing undress (the more informal of options), but if you’re a Patron, one of those will be up Friday. Occasionally, I see something I just want to draw it. That was what happened with this amazing fashion plate. I was in love the moment I saw it. I was a little worried about the ruff at the neck, but I think it came out okay. Specific Source Images: This Dress from 1817, these boots from the London Museum & this bag from the Met. If you’re super observant, you might notice that the cuffs on this dress are the same as the cuffs on the day dress. This cuff style was super popular. When you see a style popping up on multiple garments, it’s usually evidence that people were into it. Friendly reminder that if you want to see a morning dress tomorrow, join us on Patreon. 2 dollars a month gets you an extra paper doll dress every Friday. So, which dress this week has been your favorite? Personally, I’m a big fan of today’s dress. Let me know in a comment. There’s a perception that the Regency era was all white dresses, white stockings and white shoes. Never mind the fact that there is still mud in the 1800s and there’s not the kind of laundry capacity we have now. I knew I wanted to do a richly colored day dress in patterned cotton. Day dresses were a form of undress or half-dress (as I mentioned yesterday). This dress is a more middle class style and certainly casual. Printed cottons were very popular in the era and this color is called Turkey red. The “turkey” part of the name refers to the country of Turkey, not the bird. Her bonnet is a bit earlier than the dress- it’s a soft sort of style that was super popular before 1810 and then seems to fall out of fashion a bit for harder stiffer styles. I have one of those bonnets for tomorrow. The dress’s silouhette comes from this gown from the V&A Museum. The print on the dress and the colors are from this swatch from Ackermann’s Journal. That was a fashion journal that included pasted in fabric/paper swatches. Specific Source Images: These stockings, these shoes, this dress, this bonnet (bottom left) and this fabric. One of the challenges though of working in historical clothing is that I don’t know what would be considered “tacky”. Would it be tacky to combine blue stockings with green shoes and a red dress? Is this too much color? How would a woman of this period actually feel about this combination? I have no idea. I just noticed there’s a tiny coloring error in this set. How embarrassing! I’ll get it fixed when I can. Probably not this week though (this week is a bit crazy). I’m not planning to do a mourning dress, but how cool are these mourning dress fashion plates? I always think of the obsession with mourning clothing being a Victorian thing, but here’s the early stages. So, what do you think of today’s dress? Love it? Hate it? Wish it was white? Let me know in a comment. 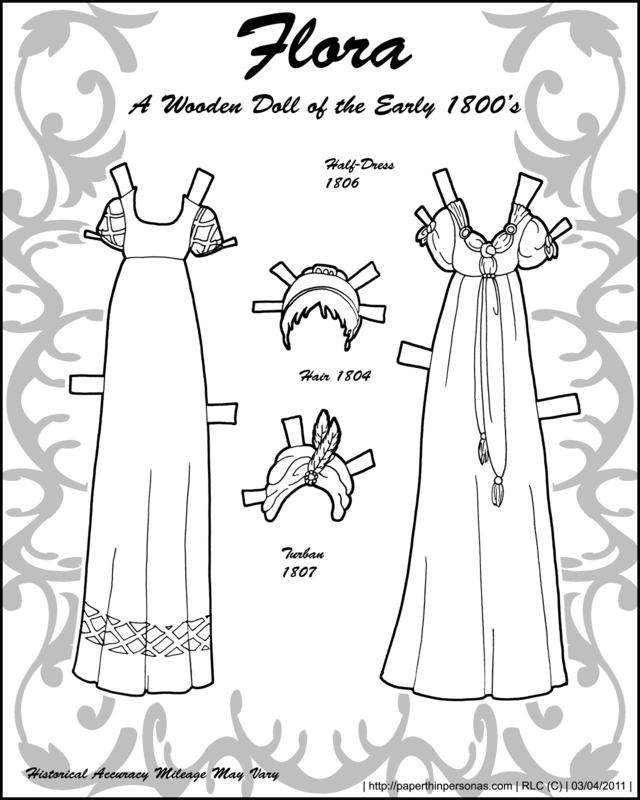 This is the first day of gown for the Regency paper doll I posted on Monday. Part of why I made this the first gown is that the shoes that go with this dress are with that Regency paper doll. In the world of Regency clothing, there were three forms of dress- undress, half-dress and full-dress. Undress was most casual. Full-dress was most formal. Half-dress goes somewhere in the middle, but isn’t as easily defined. There’s a nice overview on Full-dress here. Ballgowns, like today’s paper doll dress, were definitely full-dress. They were also really really low cut. So low cut, in fact, that I had to make the neckline higher to cover the stays I created. Sometimes, I kinda wonder how ladies stayed in these dresses before the era of fashion tape. I mean, one wrong move and you’d be flashing everyone at the party. When I planned out my Regency fashion week, I knew I’d need a ballgown. And I love regency era ballgowns. I think they are so pretty! I chose a gown from 1818 in a rich gold color to illustrate and I accessorized with the required over the elbow gloves and a small bag which I’m not sure is really an accessory a women would have carried. Specific Source Images: This Dress from 1818 and this bag. I think I always picture the Regency as being nothing but white clothing, but really I kept seeing this rich yellow. I love color! So, any excuse to use it. I want to give a shout out to my Patrons without whom the blog wouldn’t be around. Thank you to all of them. Join up if you’d to get extra paper doll content & support the blog. What do you think of today’s ballgown? Your style or not? Let me know by leaving a comment.